KC Sign Helps Local Township Step into the Digital Age with a New LED Sign. A partnership between KC Sign and Awning and Armour and Sons Electric won the bid to build and install a new LED sign by Vantage LED for Bristol Township in PA. Located in southeastern Pennsylvania, Bristol Township is a historic community that offers a small town atmosphere where you’ll find exactly what you’re looking for. Now, it will be much easier for residents and newcomers to be aware of the latest events. 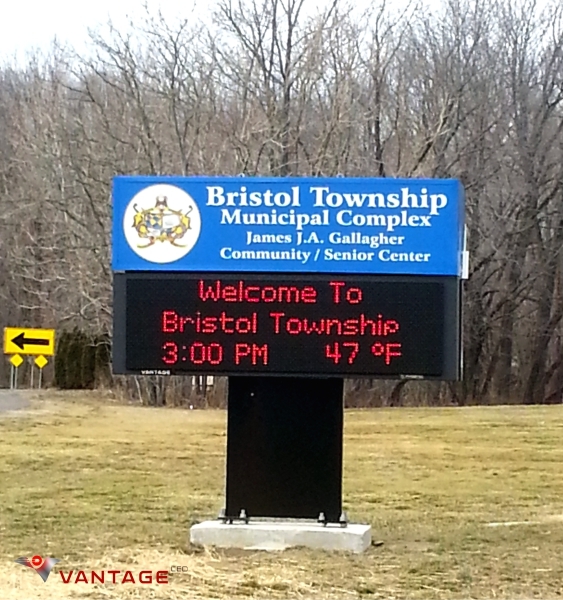 Bristol Township recently replaced their old wood and post panel signs with a new dynamic identification sign featuring an LED message display. The township can use the LED display for special events, amber alerts, and news, keeping the community updated and involved. The sign was provided by a partnership between KC Sign and Awnings and Armour and Sons Electric. KC Sign and Awning built the complete identification sign featuring an LED display from US-based manufacturer, Vantage LED. They also provided on-site setup and training. Armour and Sons Electric were responsible for the entire installation. Now, the residents will be updated 24 hours a day and become engaged in community events and local fundraisers, as well as alerted of special notices. LED displays are proven to be the most effective means of advertising to a targeted audience. Very energy efficient, the LED display can be easily updated by the township’s computer through a wireless data connection. KC Sign and Awnings installed a Vantage LED Phoenix™ Full Color LED display featuring the powerful Darwin™ Industrial Control Unit that can handle the most demanding high resolution video and graphics. The township controls the LED display using the simple, yet powerful, LightSpeed™ software. The software is user friendly for the simple user, yet still packed with advanced features for the most tech-savvy user. The township prides itself on building a safe, pleasant, and rich environment for their residents with great schools, flourishing businesses, and outstanding health care facilities. Now, they look forward to communicating with the community everyday with their new LED display. Established over forty years ago, Armour & Sons Electric, Inc. has grown from a small home-based business to the large, multi-million dollar corporation that it is today. Built slowly and efficiently, they never sacrificed quality for the sake of versatility or profit. KC Sign & Awnings is a full-service signage provider with offices in PA, DE, and NJ. They are a growing and successful sign and awning manufacturing firm. Their business success is built from years of supplying tens of thousands of customer with the best quality and service at the right price. Vantage LED is a premiere U.S. manufacturer of LED Signs based in Corona, CA. Supporting a competitive and successful dealer network in both the United States and internationally, the success and solid growth of Vantage LED is due to its unique ability to produce a highly reliable, technologically-advanced product at a competitive price from its state-of-the-art Southern California manufacturing facility.